← Flesh Eaters Rise Again In 2019! Chris D Reveals Secrets Of Their Un-Deadening! “Suspiria” (2018, Lionsgate Home Entertainment) Timid American dancer Dakota Johnson enrolls at a prestigious dance school in Germany, where her training by a formidable Tilda Swinton gradually reveals a more sinister intent. 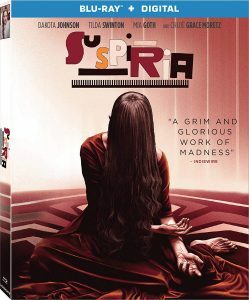 Like last year’s “Hereditary” and “Mandy,” this audacious revamp of Dario Argento‘s psychedelic shocker by Luca Guadagnino (“Call Me By Your Name”) works both sides of the horror coin, offering a feminist perspective on its occult trappings and semiotic debate on art and politics for arthouse viewers while also satisfying the grindhouse/gorehound faithful with berserk, blood-soaked violence. 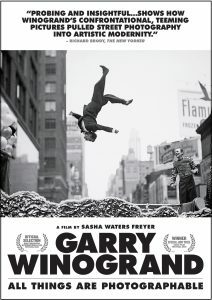 It’s also wildly pretentious, and ultimately a bit of a drag (e.g., an unnecessary subplot about Holocaust survivor guilt), but it’s beautifully lensed and boasts an incredible performance by Swinton in two (maybe three) roles, a gorgeously eerie score by Thom Yorke and a touching cameo by original “Suspira” star Jessica Harper. Lionsgate’s Blu-ray includes making-of featurettes and profiles on the special effects and choreography. 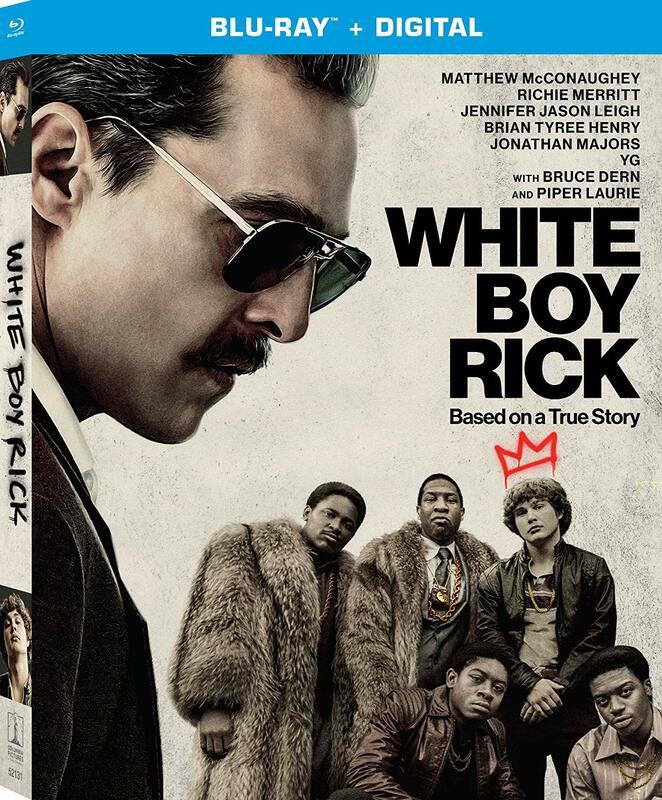 “White Boy Rick” (2018, Sony Pictures Home Entertainment) Biopic about Richard Wershe, Jr., a teenage drug dealer and FBI informant in 1980s-era Detroit whose career was cut short by a life sentence for cocaine possession. Wershe’s case is complex, involving police corruption and alleged connection to the city’s then-mayor, but director Yann Demange frames the story as a family drama hinged on Wershe Jr. (newcomer Richie Merritt) and his hardluck dad (Matthew McConaughey), who are envisioned as two sides of the same doomed-hustler coin, with occasional forays into high-stakes dealing. The former benefits from McConaughey’s jangled-nerve performance and support from Bel Powley (as Wershe’s sister) and Bruce Dern and Piper Laurie as his sniping parents, but the latter suffers from a surfeit of gangster clichés and Merritt’s wan presence. Sony’s Blu-ray includes making-of featurettes and docs on the real Wershe, who’s still behind bars. “Garry Winogrand: All Things Are Photographable” (2018, Greenwich Entertainment/Kino Lorber) Excellent overview of the celebrated photographer‘s life, detailed through his vast array of pictures, which underscore his talent for discovering the extraordinary in the seemingly ordinary. Director Sasha Waters Freyer traces the arc of Winogrand’s career, from his photojournalist beginnings in the ’50s to his breakthrough in the early ’60s, where his work stood shoulder-to-shoulder with Diane Arbus and Lee Friedlander, is traced through interviews with critics and fans, incuding “Mad Men’s” Matthew Weiner; the perceived decline in his work, which coincided with his move to Texas and California and the release of his controversial “Women are Beautiful,” also receives a thorough reconsideration. Winogrand’s photographs, which find a sort of unconscious intimacy and mystery in “street scenes,” do much to sell his significance, and the film and sound clips of Winogrand himself offer a rare glimpse at the man determined to capture as much of those elements as he could in his short lifetime. 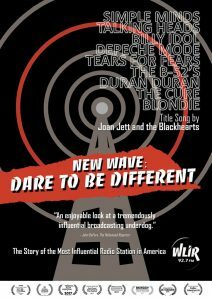 “New Wave: Dare to Be Different” (2018, MVD Visual) Earnest indie documentary examines the rise of punk and New Wave in America through the prism of WLIR, a tiny radio station on Long Island, New York which was the first in America to devote its airwaves to the burgeoning sound. 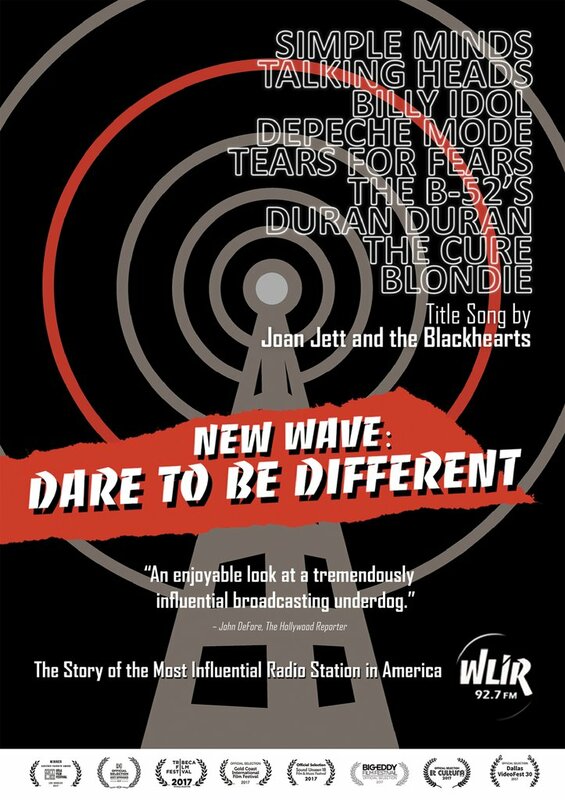 Interviews with programming director Denis McNamara and members of the on-air staff detail the station’s heyday and struggles with the FCC (which led to its demise in 1987), while musicians like Debbie Harry, Joan Jett and Fred Schneider recall the impact of the station’s support on their nascent careers. It’s bittersweet and slight, with a strong vein of you-hadda-be-there running throughout, but will most likely deliver a heady dose of nostalgia for those that remember terrestrial rock radio as a lifeline. 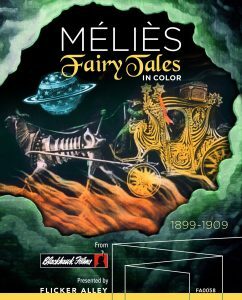 “Melies: Fairy Tales in Color” (2018, Flicker Alley) The term “new” applies less to the 13 silent shorts compiled on this Blu-ray/DVD set – all were directed between 1899 and 1909 by film pioneer Georges Melies – and more to their digital restoration by France’s Lobster Films, which revives the image quality and in particular their color, which was originally created by hand-painting each frame. The color elements add not only vibrancy but nuance to the films: the reds of the flames that threaten Joan of Arc in her 1900 biopic or dance behind the Devil in “The Merry Frolics of Satan” (1906) enhance the otherworldly quality of their scenes, while the shift from (literal) earth tones to impressionistic yellows and pinks in space underscores “A Trip to the Moon” (1902) more boldly that black and white. The colors are striking (and fluid) enough to capture some younger viewers’ attention, as will the subject matter, especially “The Kingdom of Fairies” (1903) and “Rip’s Dream” (1905), though some of the imagery in “Satan” drifts towards nightmare material, even by turn-of-the-century standards. 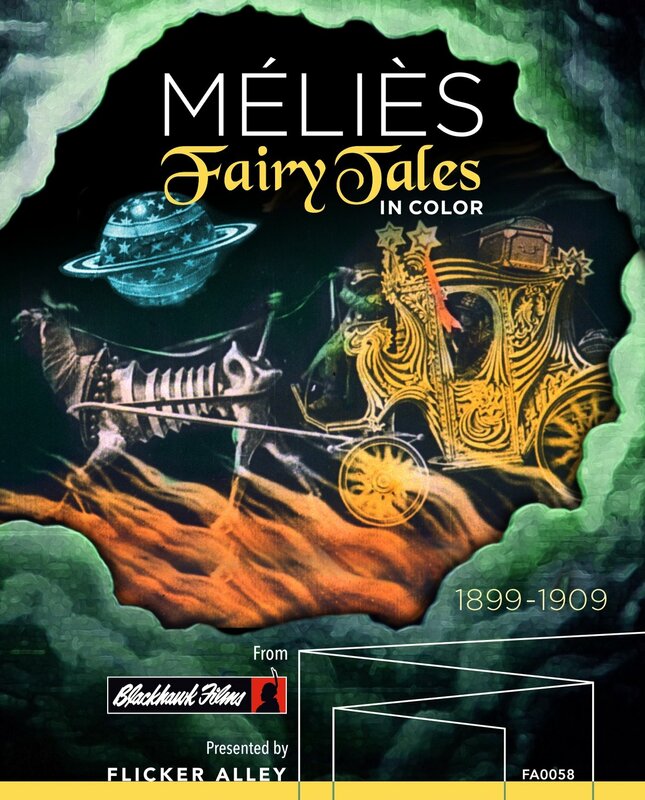 Flicker Alley’s set includes detailed liner notes on the films and restoration, as well as narration (adapted from Melies’ original texts) by Lobster’s Serge Bromberg, whose Gallic accent only adds to the charm. This entry was posted in Art, Movies, Music and tagged Flicker Alley, Greenwich Entertainment, Kino Lorber, Lionsgate, Lobster Films, MVD Visual, Sony Pictures Home Entertainment. Bookmark the permalink.